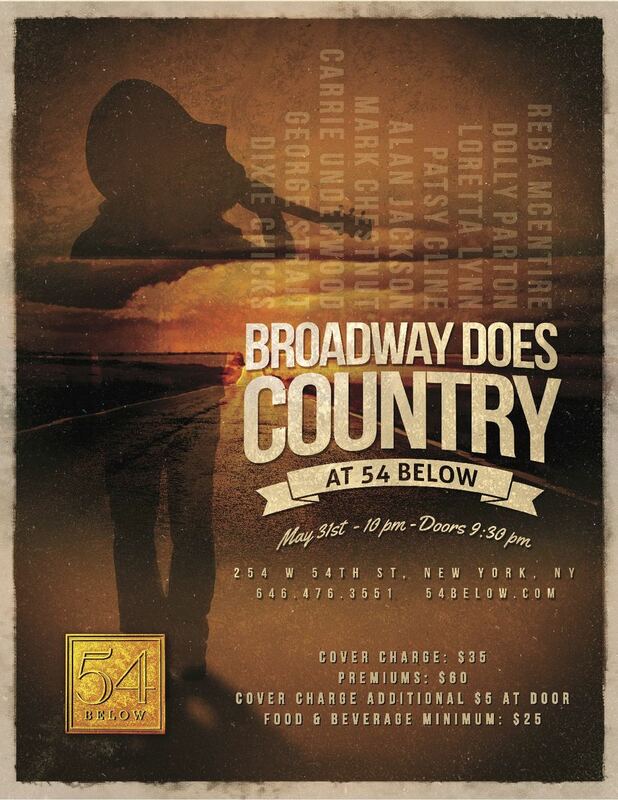 54 BELOW, Broadway’s Supper Club, presents a selection of Broadway Stars in Broadway Does Country on May 31, 2015 at 10PM Broadway Does Country, is an authentic hoedown which celebrates the best of country music. Broadway Does Country, is an authentic hoedown which celebrates the best of country music. David Andrews Rogers is the musical director, and the vocalists are backed by a five-piece country band. Attendees can expect to hear songs by Reba McEntire, Dolly Parton, Loretta Lynn, Patsy Cline, Alan Jackson, Mark Chestnutt, Carrie Underwood, George Strait and Dixie Chicks, among others. Broadway Does Country plays 54 Below (254 West 54th Street) May 31, 2015 at 10PM. There is a $35-$60 cover charge and $25 food and beverage minimum. Tickets and information are available at www.54Below.com. Tickets on the day of performance after 4:00 are only available by calling (646) 476-3551. 54 BELOW, Broadway’s Supper Club, is the new performance venue in the grand tradition of New York City nightlife. A few blocks from the heart of Times Square and just below the legendary Studio 54, 54 BELOW is a classically designed state-of-the art nightclub in the theatre district that hosts audiences with warmth and style. The venue provides a food and beverage menu from early evening through the wee hours of the morning that is worthy of the world-class entertainment on the stage. In their description of 54 BELOW, The New York Times writes “the club has the intimacy of a large living room with unimpeded views and impeccable sound; there is not a bad seat. Its sultry after-hours ambience is enhanced by brocade-patterned wall panels planted with orange-shaded lanterns. And the atmosphere is warmer and sexier than in Manhattan’s other major supper clubs.” Located at 254 West 54th Street, 54 BELOW features up to three shows nightly with cover charges ranging from $15-$95.